In volleyball, a team of six players works together to return the ball to the opposing team’s side of the net in three hits or fewer. Players may contact the ball with any part of the body during a hit, but if they violate other rules about playing the ball, they risk losing points for their team. 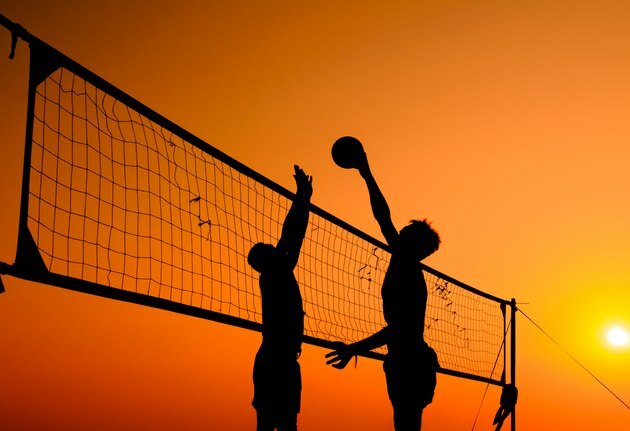 Rules set by USA Volleyball and the Fédération Internationale de Volleyball provide the standard for competitive volleyball. USAV and FIVB rules prohibit assisted hits. In an assisted hit, a player within the playing area takes support from a teammate or other structure while attempting to hit the ball. If a player commits an assisted hit fault, his team loses the point. Players may take support from a teammate to avoid crossing the center line or touching the net, however. Players may not catch or throw the ball at any point during a match. If a player catches or throws the ball, the referee will call an illegal contact and award the opposing team the point. Players may not hit the ball twice in succession. If, for example, a player makes a dig after the ball comes over the net, she may not then set the ball. A player also may not contact the ball with various parts of the body in succession. A player may, however, hit the ball again after making a block. Blocks do not count toward a team’s three hits, according to FIVB and USAV rules. After a block, a team may make three more hits, and any player can contact the ball first. A player may not reach beyond the net to interfere with an opponent’s play either before or during an opponent’s attack hit. A player may not reach beyond the net to make an attack hit while the ball remains on the opposing team’s side of the net. Blockers may contact the ball beyond the net as long as they do not interfere with an opponent’s play, and attackers may reach beyond the net after contacting the ball within their team’s playing space. A player in a back-row position may not make an attack hit from the front zone while the ball remains above the top of the net. Players may not attack an opponent’s serve from either the front or back zone while the ball remains in the front zone and above the top of the net. The libero player, a defensive specialist, may not make an attack hit from either the front or back zone while the ball remains above the top of the net. If the libero player makes an overhand finger pass from the front zone, players may not attack the ball while it remains above the top of the net.